Though it all seems like a sci-fi experiment, the ECCERobot is meant help researchers better understand how humans move. Robots being part of our daily lives seems less of a question of “if” than “when.” Yet there’s no consensus on how they’ll look or work. Will they be Asimovian metal bipeds or something we haven’t even imagined? Researcher Owen Holland from the University of Sussex has a vision of the robot future that’s equal parts grotesque and convincing. His vision (built by Rob Knight’s The Robot Studio), ECCERobot, is a robot built with the body of a human. It has most of our same bones (though fashioned from plastic rather than calcium), and its muscles work much like ours (though they’re driven by kitestring). ECCERobot looks like a human with much of the skin and connective tissue removed, and that’s entirely the point. This way of building produces a robot that’s safe for humans to interact with. 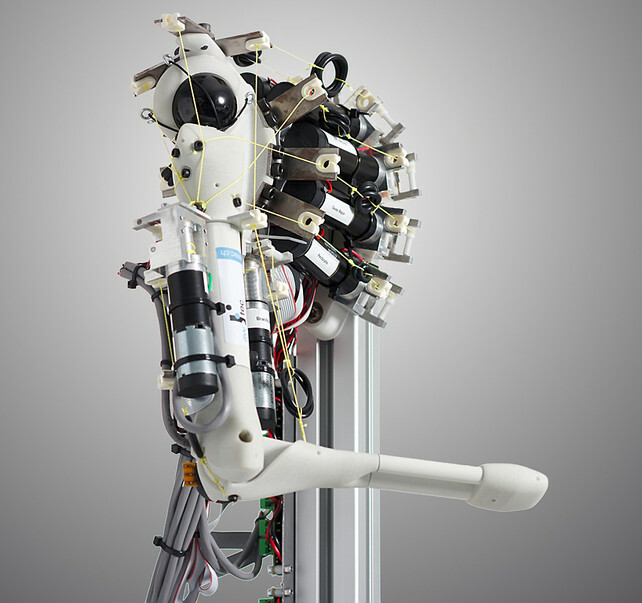 Now ECCERobot isn’t quite a 1:1 humanoid robot. It’s clearly missing articulating legs. And some components were simplified by engineering necessity–we can’t precisely duplicate human wrists and thumbs because no engineer can manufacture their small, strong muscles and tendons yet. All the same, the robot’s body functions a lot like a human, to the point that the discs between segments in its spine gradually compress during the day (just as they do in our own bodies). “We have to lie it down every night to allow the discs to recover their shape, and so the spine goes back to normal,” Holland says. As silly as a robot that “sleeps” may sound, it’s these very human limitations that make ECCERobot so promising as an android companion. This human “softness” counterintuitively creates a more durable robot, as its body can absorb impacts better than a rigid structure. Iron Man may stop a bullet, but our organic jelly bodies are inherent experts at taking a fall or a punch. Personally, I want to get the poor robot a shot of morphine and a decent coat of skin. Then, and only then, will I give it one of my world-renowned hugs (because the poor guy sure looks like it needs one).